On 4 July 1927, the French Minister of the Interior, Albert Sarraut, wrote confidentially to the prefect of the Normandy département of Seine-Inférieure requesting immediate action to prevent the section of the ‘Indochinese Mutual Association’ based in Le Havre from distributing the newspaper Viet Nam Hon. Sarraut warned the prefect that ‘revolutionary propaganda generated in Paris could have regrettable repercussions in Indochina’ and that it was suspected that the most important departure point for copies of the newspaper was Le Havre. The letter identified one Dang Van Thu, a colonial migrant and protégé from the French protectorate of Annam, owner of the Restaurant Intercolonial in the rue Saint Nicolas, as leader of the ‘Indochinese Mutual Association’ and an instrumental figure in the distribution of the newspaper that was provoking anxiety in Paris. The case of Dang Van Thu and his life in Le Havre reveals some of the peculiarities of policing under the French Third Republic, a polity traditionally viewed as being highly centralized. Like many colonial migrants after World War One, Dang Van Thu, also known as ‘Le Gros Louis’, was monitored by the Paris-based Service de Contrôle et d’Assistance aux Indigènes des Colonies (CAI) which had been created in 1923. Making liberal use of spies, and of informers drawn from the ethnic groups being monitored, the officials kept close watch on anti-colonial activities and urban associations, being fearful — amid the global red scare — of radical political activity which could threaten France’s empire. While the reach of the CAI was, in theory, national, coordinating locally with the Préfecture de Police in Paris and playing to the apprehensions of prominent national politicians about communism, immigrant criminality and foreign agitators, in reality the capital was the primary location for its activities. In provincial cities, including Le Havre (the most important French port for transatlantic travel in the first half of the twentieth century), surveillance was for the most part carried out by local police forces. How they dealt with people such as Dang Van Thu, classed by Paris as a dangerous revolutionary, reveals disparities between Parisian and regional policing and how far policing in Le Havre was contingent on the ways in which individual officials interpreted and contextualized ‘threatening’ activities and how they defined ‘otherness’. During the interwar period the Vietnamese population in Le Havre was small in comparison with those in Paris and Marseille, but it was viewed by the municipal police, the CAI and the prefect of the département as potentially dangerous. Dang Van Thu excited much attention from the agents of the CAI as a potentially dangerous agitator and linchpin of the anti-colonial network of Vietnamese workers in France. Unlike the student-based Vietnamese organizations in Paris, Dang Van Thu worked primarily with working-class immigrants and, after Nguyen Ai Quoc (the future Ho Chi Minh) left France, he attempted to forge cooperation between working-class immigrants from France’s colonies. He arrived in Le Havre in 1920 and worked as a cook on a steamer until 1925 when he opened an ‘Annamite restaurant’ at 5 rue St Nicolas. The ‘Restaurant Intercolonial’, a name that recalled the intercolonial aspirations of Nguyen Ai Quoc, became a centre for anti-colonial activities involving both Vietnamese sailors and dockworkers from France’s colonies in Africa, and could be hired out for 300 francs a night to communist agitators. Dang Van Thu was also reported to have been at the centre of revolutionary and militant activism in the city. Dang Van Thu was monitored carefully by agents from the CAI, who noted with consternation his connections with known Paris-based activists. He was also a person of interest for the police of Le Havre, who, although mindful of his wider anti-colonial activities, were primarily concerned with what they perceived as the dangerous links which he was creating with other militant and revolutionary groups in the city — principally with communists. But if Dang Van Thu was so dangerous, why was he not stopped? 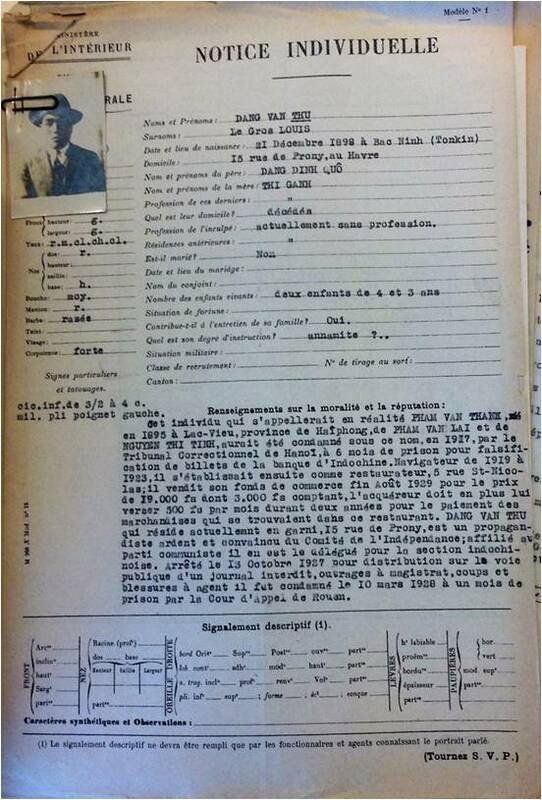 Attempts to expel him failed due to his classification as a ‘protégé français’ (he was from the French protectorate of Annam), but he was listed on the Carnet B (the list of political enemies that the government kept in case of a national emergency) from 30 July 1927. In provincial towns the effectiveness of the police surveillance was questionable: between 1914 and 1940 the municipal police force of Le Havre comprised, on average, about 300 men for all duties, and there was only ever one commissaire spécial [superintendent] based in the port. The French police may have developed the practice of ‘shadowing’, with the Sûreté Générale specializing in surveillance techniques that German policemen during the Occupation were quick to adopt , but the implementation of these techniques in Le Havre shows the disconnection between national policy, Parisian practice and local realities. Surveillance was hampered by linguistic difficulties, a problem which resonates throughout the local police reports. Whereas the CAI made use of informers drawn from the ethnic groups being monitored, the municipal police force of Le Havre, in contrast with that of Bordeaux which made extensive use of ‘Annamite informers’ recruited from the student population, was reliant upon its own personnel. As a result undercover action was impractical, the ethnicity of the personnel meant that police officers were immediately recognized, and linguistic difficulties meant that informers could not comment on what had been said in political meetings. 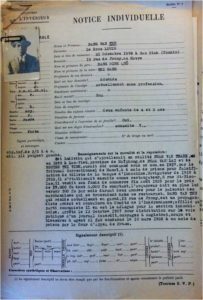 Dang Van Thu’s final departure for Paris, with his common-law wife and two children on 9 May 1934, was reported with great relief by the local police superintendent to the prefect: a disruptive criminal who had been cohabiting with a Frenchwoman was no longer Le Havre’s problem. At this point Dang Van Thu disappears from the archives, revealing that on his arrival in Paris he was not picked up by the monitoring services of the Paris-based CAI or the Préfecture de Police. The fizzling-out of the Dang Van Thu episode is at odds with the notion of a highly centralized operation which, in its readiness to round up and expel colonial subjects, has been deemed by Stovall to ‘set a pattern for the expulsion of the racial Other that would resurface, far more tragically, with the deportation of foreign Jews to the death camps of the 1940s’ , Le Havre shows how local policing under the Third Republic, a polity traditionally represented as being characterized by strong centralization, could be shaped by a single superintendent’s interpretation of who constituted a danger to society. Kate Marsh (Professor of French Historical Studies, University of Liverpool) is a specialist in French colonial history. Her research focuses principally on French metropolitan representations of colonialism and on the rivalries and collusions between competing European colonial powers. Her current project is a major re-examination of colonial encounters in French port cities during the interwar period. Her forthcoming article, ‘Colonial workers, imperial migrants and surveillance: policing in Le Havre, 1914–40,’ will appear in Social History 43,1. J.-M. Berlière, ‘A Republican political police? Political policing in France under the Third Republic, 1875–1940’, in M. Mazower (ed. ), The Policing of Politics in the Twentieth Century: Historical Perspectives (Oxford, 1997), 27–56. T. Stovall, Paris and the Spirit of 1919: Consumer Struggles, Transnationalism, and Revolution (Cambridge, 2012), 289. This entry was posted in Uncategorised on 29th November 2017 by Grainne Goodwin.